Regret is something that I have become intimately acquainted with over the years. One of my earliest memories of regret, loss and sadness happened during the celebration of my sixth birthday. My parents welcomed my aunts, uncles, cousins and grandparents on the evening of January 20th, 1975 and my heart filled with excitement. Everyone walking through the front door carried a present in their arms for ME! The presents were placed on the kitchen table next to my Evil Knieval decorated cake and my excitement grew. The time came for the singing of happy birthday and the opening of the presents. The lights were turned low and voices sang in my honor. With one big blow I made the flames on the candles disappear. 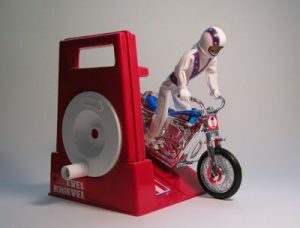 As I would open a present one of my relatives would take it and stack them on the kitchen counter. Somehow, no one noticed the huge candle burning, which was on the same counter as the presents were being piled. About halfway through through the unwrapping ritual I opened up a navy blue and yellow shirt. If you are from Michigan (like I am) those colors can only mean one thing and that’s the University of Michigan – Go Blue! That shirt was promptly placed on the growing pile of presents (next to the lit candle) and I moved on to the next gift. As I began unwrapping it the room quickly started to smell like something was burning. Everyone looked to the counter and there was my U of M shirt going up in flames as the candle set it ablaze. My dad grabbed the shirt as it continued to grow into a ball of fire. He threw it out the back door and into a snow bank where it was quickly extinguished. As I saw my dad throw my shirt out the door there was sadness and loss that overcame me. I ran to my bedroom, leaving everyone in the dining room, and threw myself onto my bed, crying my eyes out. One of my parents, I don’t remember which, came and comforted me. My breakdown probably only lasted ten minutes but 40 years later, as I write this, the emotion of that moment is still very real. Was there anything I could have done about my shirt burning to a crisp? No, I wasn’t the one that even put it near the candle. But I still felt regret and loss. I did have the thought, even at that age; ‘what if I had held onto my shirt – it wouldn’t have went up in flames’. My experience with regret and loss at the age of six, in the grand scheme of life was small. But regret is something that I have struggled and wrestled with throughout my life. Things like my parents divorcing when I was twelve to not making the sixth grade basketball team opened the door for regret. As an adult the regret of not speaking up for myself or family in different situations has happened more than once. Decisions I made caused undue stress on my kids that brought on regret. Even throughout my professional career, there have been plenty of situations where I didn’t make the right decision and it led to me carrying more regret than I should. I have by no means totally conquered the beast of regret BUT there are some practices that allow me to properly assess the regret and put it in it’s proper place. Here are three things I try to practice when regret raises it’s head. My tendency is to take too much blame, whether or not it is appropriate or not. Because of this I always need to step back from the situation and understand the part I play in what has caused the regret. I try to look at my situation from a different perspective. What can I learn? How can I help others learn from the situation I experienced? Trying to have a long term vision instead of focusing on the immediate outcome. If I have done all I can to change a situation, and still don’t see a change, I have to come to a place of peace. I have to get to the place of letting things go. Again, for me and my personality this is one of the most difficult things to do. But, regardless of what does or doesn’t come naturally it’s something I have to strive for. So, as you approach 2017 don’t hold onto the regrets of 2016. Take responsibility for the things that you need to but don’t take more blame than you should. Put your failures in perspective and learn from them. And come to peace with the things you can’t change. 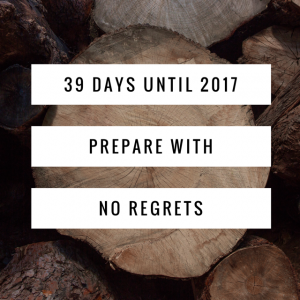 Enter 2017 with a clean slate and free from regret. Earlier this year, I came across this great article on Psychology Today that goes even deeper into the topic of regret. Take a read for even more on the topic of regret right here.